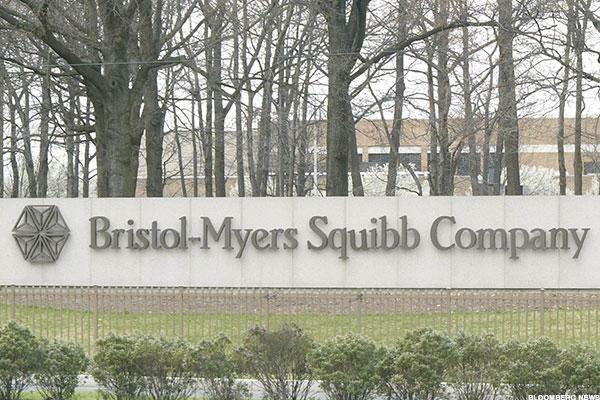 Multinational drug giant Bristol-Myers Squibb (BMY – Get Report) will report third-quarter earnings before the opening bell Tuesday. And while its shares — trading at a P/E of 57 — aren’t cheap today compared to a P/E of 21 for the S&P 500 (SPX) index, there’s an implied 15% gain on the table, based on the stock’s average analyst 12-month price target of $74, which is about $10 higher than current levels. The New York-based company is projected to have a solid year in 2016. Consensus earnings-per-share estimates of $2.23 implies a 22% year-over-year earnings jump above 2015 estimates of $1.84 a share. Aside from the projected earnings growth of almost four times the average stock in the S&P 500 index, this would also drop the stock’s forward P/E to 26. True, that’s still pricey against a forward P/E of 17 for the S&P 500 index, but Bristol-Myers is projected to grow earnings at an average annual average rate of 17% in the next five years. That projected five-year earnings growth rate would be almost three times the projected growth rate of the S&P 500 index, where — on average — companies have to grown earnings by a rate of around 6%. What’s more, given the company’s projected 7.4% revenue growth for 2016, which is above analysts’ consensus of 5%, Bristol-Myers demonstrates the level of confidence that suggests its stock — expensive or not — can produce healthy gains in the quarters ahead and years ahead. STOCKS TO BUY: TheStreet Quant Ratings has identified a handful of stocks with serious upside potential in the next 12-months. Learn more. Earlier this month Bristol-Myers announced that three of its supplemental new drug applications seeking label expansion for Daklinza — its hepatitis C drug — have received priority review status by the Food and Drug Administration. The company said a final decision from the FDA is expected within six months. This means by April of next year, Bristol-Myers’ drug Daklinza can potentially become a bigger profit generator for the company, putting it on track to better compete with the likes of Gilead Sciences (GILD – Get Report) and Abbvie (ABBV – Get Report) . True, a drug review — priority or otherwise — by the FDA is no guarantee of success. But assuming Bristol-Myers achieves its desired result, this would mean that analysts’ revenue and earnings projections for 2016 may yet be underestimated. And that’s reason enough to want to own BMY stock, which pays a 37-cent quarterly dividend, yielding 2.30% annually, ahead of Tuesday’s results.